When it comes to owning a pool, safety is key. Owning a swimming pool can be a lot of fun, especially if you have children. On hot summer days, you can spend all day playing, swimming and laughing in the pool, but along with the enjoyment and fun of owning a pool, there also comes a measure of responsibility. It is up to you to take all of the safety precautions you can, in order to properly ensure the safety of others. Make sure that there is at least one adult who has CPR training. Also, keep safety equipment within eyesight and reach of the pool, and above all, invest in a mesh safety pool cover, pool fence, or pool net. Arizona Pool Fence’s mesh covers offer safety and peace of mind in addition to heating and protecting your pool. The benefits of a safety pool cover are numerous for anyone that owns a pool. The first and foremost in the eyes of Arizona Pool Fence is the safety aspect. In order for a safety pool cover to be safe it must undergo rigid independent testing to meet certain minimum requirements in order to qualify as an ASTM safety pool cover. This is a coveted certification for any product in the pool safety category and every cover that has the Arizona Pool Fence name on it has this badge of quality associated with it so that you know it not only meets but also exceeds the standards set forth by ASTM. Why Choose Our Mesh Pool Covers? 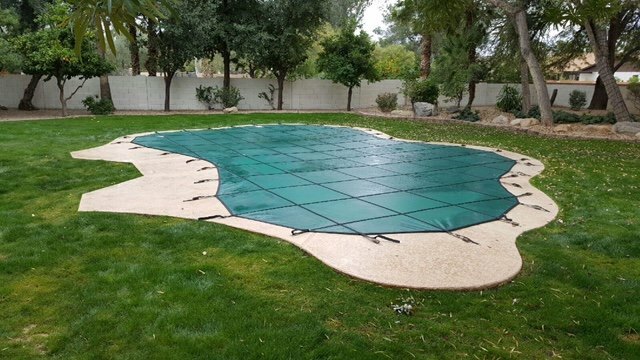 After measuring your pool, we use computer-aided-design to create safety pool covers that fit perfectly ANY size or shape of pool. Without paying more, you get a strong, safe pool cover that meets or exceeds ASTM Standards ES1346-91 for pool safety covers, when properly installed. 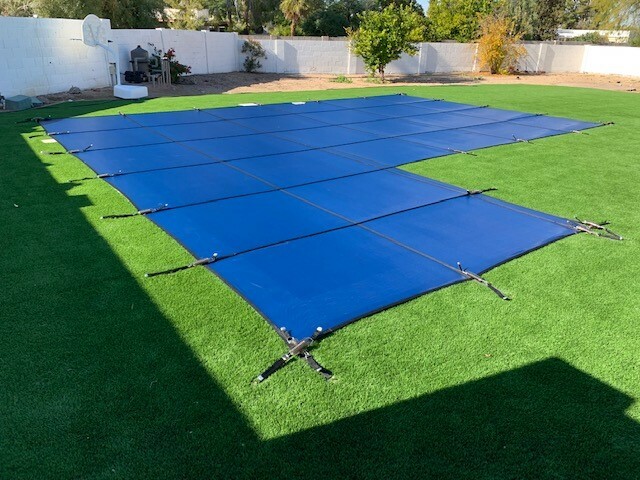 Arizona Pool Fence’s superior hardware technology, with high performance stainless steel springs and sturdy brass anchors, makes our swimming pool covers safe and easy to use. In addition to premium materials we use (see below for details), our construction of safety pool covers is unsurpassed in the industry. For example, we were the first to feature double webbing, which is stitching both on the top and all the way underneath – not just the first 18 inches underneath like most of our competitors. We also use triple-stitched bonded threads and add an ”X” and box stitch at the perimeters for extra strength. Safety pool covers mean extreme protection and safety because they come with double-webbed lining. This means that they are far more durable and stronger than regular pool covers. If someone were to accidentally walk on top of a regular pool cover, they will most likely fall in the pool (taking the cover with them). This can be very dangerous. But, because safety pool covers are incredibly strong, you don’t have to worry about anyone falling in the pool when they are on it. What is Arizona Pool Fences pool safety cover warranty? The durability of our products allows us to offer a 15 Year Warranty – 3 Years Full Coverage. Our experienced installers have an eye for safety and will take note of any unique features in your pool environment that need to be addressed. How do you produce higher quality pool covers and pool fencing products at competitive prices? It starts with our state-of-the-art swimming pool cover manufacturing facility that includes computer-aided-design and a carefully engineered layout that maximizes efficiency. Plus we handle many processes in-house that other manufacturers farm out. With our pool covers, this includes the all-important lock stitching. The result is higher quality, more efficient processes, and no internal shipping costs. It also means our work isn’t dependent on someone else’s schedule, so we get your swimming pool cover done on time! What do Arizona Pool Fence safety pool covers come with? A convenient storage bag, installation instructions, warranty, and cover care guide. It also includes all hardware installation pieces such a heavy-duty installation tool, tamping tool, spring covers, and Allen key. Springs with specially designed bends that ensure there are no gaps between swimming pool and decking, keeping wind from blowing debris under the pool cover. 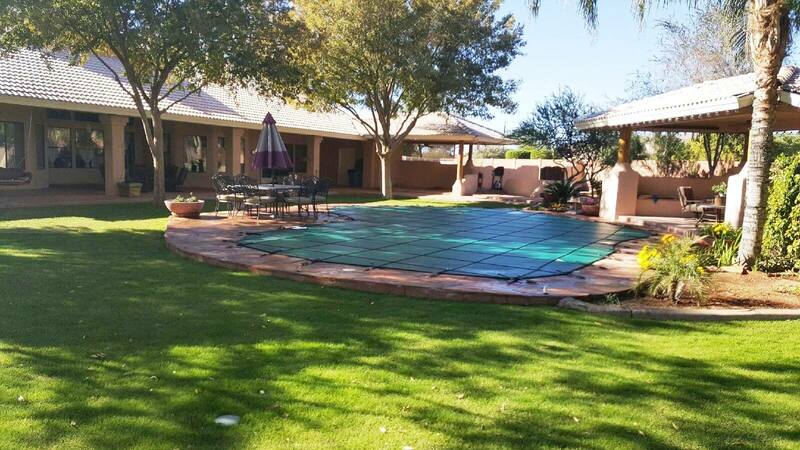 Our pool covers stand up over time because of the premium materials we use. Low-maintenance, durable mesh material… our beautiful mesh pool cover is fabricated with a unique blend of lightweight, polypropylene that stays dry and does not crack with age. Rain just drains through without collecting on the surface, while leaves and debris just dry and blow away. No water bags or pumping are necessary, and off-season maintenance is virtually eliminated.Choose the fabrics and colors that match your taste and get a perfectly fitted custom-built swimming pool cover. Options include blue, green, gray, black and black/tan combo. Our conventional mesh pool cover is nothing ordinary! It has extremely high tensile strength and is impervious to chlorine and mildew. While most fabrics on the market have a thread count of 34 x 20 per square inch, we use a thread count of 34 x 22 per square inch. Hold it up to the light, and see for yourself. The tighter weave minimizes the sunlight that passes through the swimming pool covers, therefore reducing springtime algae growth. Our Super Dense Mesh safety pool cover is our tightest woven material and has the highest shade quality. Extra strong solid pool cover material – Imagine opening your swimming pool to clear water in the spring. Well you can! By using a solid pool cover with proper water treatment and chemicals. Our solid pool covers are substantially stronger than the competition’s. Not only do they have ultra violet resistant additives, they are highly abrasion resistant. Our lightweight, Super Solid is a coated material. Unlike a laminate, the coated material is made by pouring hot liquid vinyl onto a polyester scrim. As it cools, the materials bond together. All solid swimming pool covers must use a pump or drain to prevent water from puddling on the cover. Our installation and care maintenance guides show how, with minimal maintenance, you can open your pool just as you closed it. Our new lightweight, super tough solid pool cover is substantially stronger than our conventional solid pool cover. It is also highly abrasion and UV resistant.